What on earth is she talking about, read on and you will find out. As you know I am very busy painting for my shows right now and I have been receiving some good advice and help from Rosiecats. 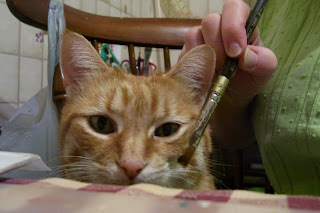 For a couple years now Rosie jumps up beside me at the table while I paint and I have to stop what I am doing to paint her whiskers. Of course no paint only water but every time the brush swishes in the water, even if she is napping, she comes a running to get her spa treatment. Not sure how this all started. She did have a favourite brush for the longest time, my big mop brush with soft bristles and I don't tend to wet that, but once she felt the wet brush on her whiskers she loves it,so now the fav is a flat shader. Even if I don't pay attention to her, she nudges my hand with her head and even squeezes her head between my arm and the table for me to perform the task. So I can actually say my cat enjoys my painting, she sits and watches and sniffs and critiques my work. What a cat, she sure is a snoopy ole girl. So here are some things I have been working on. I won't go into all the deets just showing you what I have been up to besides the usual house stuff, gardening is pretty much done for the season. We have had a few rides on the bike this year and one just this past weekend but the leaves will be much better in another couple of weeks. They are still not at their peek yet. Always love the bike on an October sunny fall day. Ahhhh fall is in the air. A Terrye French design painted on a canvas, hanger still needs to be added. From the recent Painting ornament issue magazine, as soon as I saw this skate I knew it would look good on a canvas. 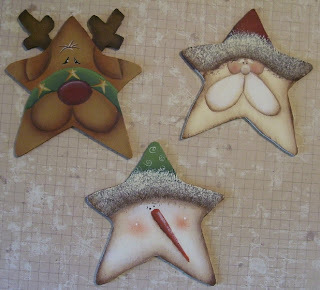 And these last 2 designs are Cyndi Combs designs which can be purchased from the Decorative Painting store online as e-patterns. Wire hangers and rusty bells still need to be added but you get the drift. My stockpile of tree ornies is really adding up. 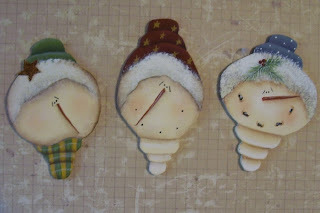 Getting lots done and some paper ornaments too. Stay tuned for some more painted goods and.......I will show you how to use your die cuts in a whole new way for Christmas ornies. Thanks for dropping by. Just so cute, your studio helper as well as your tree ornies. That is so cute about your Rosie! My sookie, just wants to sit right next to me. Maybe I should do that to her the next time! This is really cat-art . you have made some great stuff! That made me laugh out loud when I saw you "painting" Rosie's whiskers =) Everything looks fantastic as usual Les. 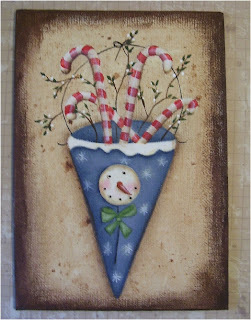 I love Terrye French designs...and JUST yesterday when at the grocery store off all places...I saw that Paint works Christmas Ornie mag...and looked at that skate ornie!! How weird is that Lesley?? 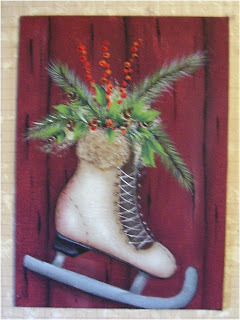 I hope to pick it up Sunday with my Joann's coupon..LOL. Your projects are beautiful!! You will do awesome at your show!! Wow Les, you have been busy! Beautiful work! And I have a helper that looks just like yours.